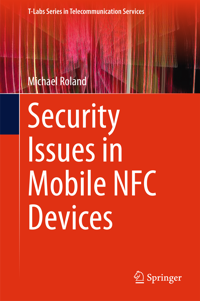 The book Security Issues in Mobile NFC Devices (a revised version of the PhD thesis of research team member Dr. Michael Roland) was published by Springer in the series T-Labs Series in Telecommunication Services this month. The book provides an assessment of the current state of Near Field Communication (NFC) security, it reports on new attack scenarios, and offers concepts and solutions to overcome unresolved issues. The work describes application-specific security aspects of NFC based on exemplary use-case scenarios and uses these to focus on the interaction with NFC tags and on card emulation. The current security architectures of NFC-enabled cellular phones are evaluated with regard to the identified security aspects.